We just finished tuning our Drag GTR32 on the Dyno and we manged to make 1025RWHP at 32psi shocked grin. i will post the Dyno sheet very soon. i think this sets the recored for the AEM EMS GTR user and proves the capability of the AEM EMS. 1- 2.6L Engine with Forged 87mm Pistons and H Beam Rods. 8- Custom 295 Duration, 11.6mm Lift Cams. Great power from the setup. I thought it would take more turbo , and more boost to make this kind of power. 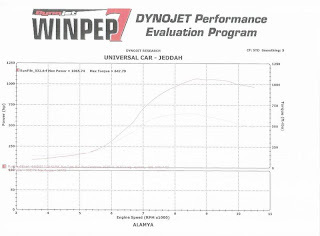 Husam said that on the road the car was making good boost by about 6400 rpm , the Dynojet wasn't loading it enough to see spool earlier. Its where I want to be with my 1045 build. I just might do some slightly different things.